SNES Super Mario World (USA) "warps" in 09:59.85 by bahamete, Masterjun & PangaeaPanga. 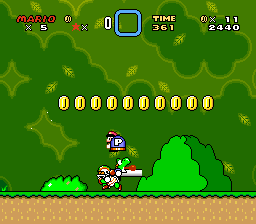 This is the 11th published movie of Super Mario World that beats the game by clearing 11 of the 96 exits, the shortest route intended by the game developers. This movie seems to be slower than the previous publication. However, barring emulation differences, this movie's in fact faster by 0.21 seconds, clocking at just less than 10 minutes. Ironically, Mario still dies in the process. A potentially more entertaining Big Boo fight.